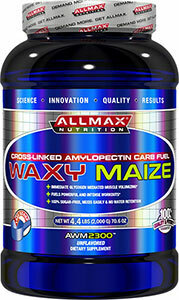 ALLMAX Waxy Maize 2300 is a superior source of carbohydrate fuel. It has an extremely low osmolarity rate, meaning, ALLMAX Waxy Maize 2300 is absorbed and digested very well. With zero sugar and no gluten, it creates zero bloating and no water retention. With a molecular weight over 3000 times greater than dextrose, ALLMAX Waxy Maize 2300 has the ability to pull other notoriously difficult nutrients, such as Creatine, Beta-Alanine and Arginine, across the intestinal wall with it and increase their absorption. ALLMAX Waxy Maize 2300 has a molecular weight over 3000 times greater than dextrose! What's in Allmax Nutrition Waxy Maize? Mix one level scoop of ALLMAX Waxy Maize 2300 (40 g) with 12 oz (355 ml) of cold water, juice, protein drink or other supplement. Use only as directed. Do not use if you are pregnant or breastfeeding. Discontinue use and contact your healthcare provider if you experience adverse reaction. Check with a qualified healthcare professional before using this product if you are under 18 years of age or if you have any known or suspected medical condition(s) including diabetes, hypoglycemia, and/or if you are taking any prescription or OTC medication(s). ALLERGEN INFORMATION: Produced in a facility that also handles egg, soy, peanut, tree nut, crustacean/shellfish and wheat products. We have a large selection of in-stock AllMax Nutrition products including AllMax Nutrition items and others for the lowest prices at SameDaySupplements.com® It's always easy to shop for Waxy Maize By Allmax Nutrition, 2000 Grams at SameDaySupplements.com because you can browse by reviews, brand, prices or search for specific ingredients using our search tool. In-stock orders placed before 3pm EST ship out the same day to USA, Brazil, United Kingdom, Canada, Germany, Australia, Japan, India, France and worldwide at the cheapest prices online.